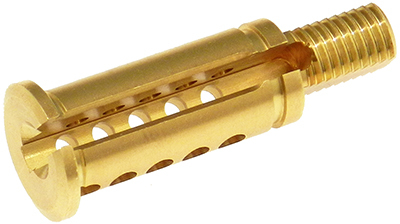 A lock manufacturer in Illinois contracted Begoun, Inc. to produce a brass plug that was to become part of a lock assembly. Tight tolerances and part configuration dictated that Begoun employ their superior custom CNC Swiss turning services to machine the component. The 24,000-part run also needed to meet tolerances of ±.0005". Begoun easily met all the design criteria, and produced the entire order in several weeks. 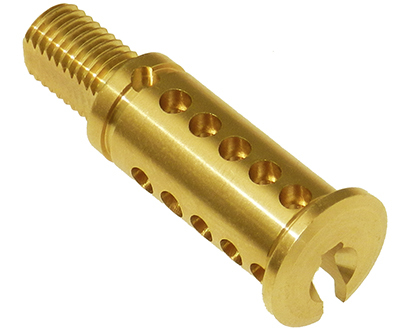 The finished brass plug, which was constructed of alloy 360 brass, featured an outside diameter .500" and a length of 1.345". All client expectations were met or exceeded by Begoun's commitment to quality and service. For more on this custom CNC Swiss turning project, please see the table below. Overall Part Dimensions O.D. : Ø.500"